Project Timer is a light task bar Windows application for timing projects. Project Timer is a light task bar Windows application for timing projects. Project Timer is a light, fast, simple, non-intrusive Windows taskbar application to assists you with your workflow for administrating, invoicing and billing hours. Interested in a free trial for Project Timer Cloud for your team? Just start a Support chat on our website or fill in this form when chat is offline. Project Timer is a simple but very powerful windows application in the task bar notification area to manage how much time you’ve spend on your projects. (time sheet style) The use of color will give a fast overview of which timer is running in the task bar notification area (tray icon). This way you can quickly but non-intrusively see if the timer for the project you’re working on is running. Activities can have different pricing per hour and the program keeps up the amount of money earned per project, as well as a summary for all your running projects. Project Timer How does it work? You can export your data into reports using the browser or import it in Excel and a simple backup of the data can be zipped, mailed and imported to keep your data safe. Our Pro version also allows you to import hours spend by co-workers or freelancers and features extra import and export methods. Sometimes you need to edit your hours afterwards. This is no problem using the administrate panel. You can remove, add and edit activities to your projects. The Cloud version allows you to collaborate with other users and teams to sync your project data. The cloud version is subscription based service. Project Timer is a light, fast, simple, non-intrusive Windows taskbar application to assists you with your workflow for administrating and billing hours. It features an easy installation and clean un-install. 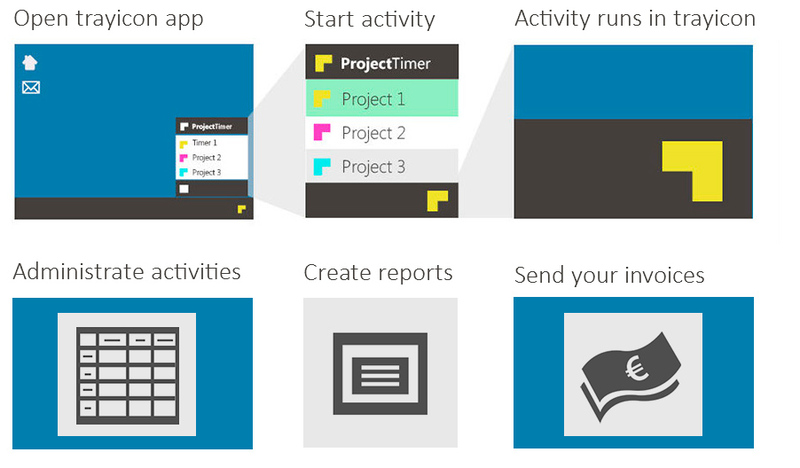 With the cloud version Project Timer Cloud, you can sync your project to the cloud. It also enables you to collaborate with other cloud users on projects. You can define roles like “Project owner” and read en write rights to manage users who can look into your cloud projects. For example you can set up your connected cloud users to be able to create reports, but not to alter activities in the project. The application areas are: advertising, small business, design, web design, healthcare, consulting and accounting, as long as you are working on a Windows machine. Project Timer is a light, fast, simple, non-intrusive Windows taskbar application to assists you with your workflow for administrating, invoicing and billing hours. It features an easy installation and clean un-install. - Sync timeout after edit. Dunes is a Dutch software multimedia company that develops windows software. We are located in Wijk aan Zee, the Netherland. We also do webdesign, PowerPoint templates and graphic design. Project Timer © 2019. Dunes MultiMedia. All Rights Reserved.